What is The Grade or Condition of My Standing Liberty Quarter? Standing Liberty quarters are one of the most difficult U.S. coin series to learn how to grade. It is a skill that has taken the most experienced coin collectors numerous years to perfect. By heeding the advice in this guide, it will get you started on your way to becoming a top-notch coin grader. Remember that coin grading is the expression of a judgment that describes the condition of an individual coin that most coin dealers and collectors would agree upon. Grading is not an exact science where a method can be followed, and everyone will arrive at the same result. But over the years, numismatists and coin grading services have agreed upon several definitions, descriptions and Sheldon's numeric values that help all coin collectors express the condition of their coins accurately. The United States Mint made minor modifications to the design that yielded three different subtypes of Standing Liberty quarters. The first type has the date raised on the pedestal that Lady Liberty as standing on. The second type is a modified reverse design that moved three stars to beneath the eagle. The third type has the date recessed on the pedestal on which Lady Liberty is standing. Each one of these modifications presents a slight difference in grading techniques. Standing Liberty quarters can be difficult to grade if you don't understand the minor nuances between subtypes. Three elementary designs were used to manufacture the coins over the fourteen years that the United States Mint produced the coin. Each one of these changes to the motif resulted in creating a new master hub that had slight differences from the previous design. This photo illustrates the highest points on the coin's design (indicated by the red coloring on the coin). 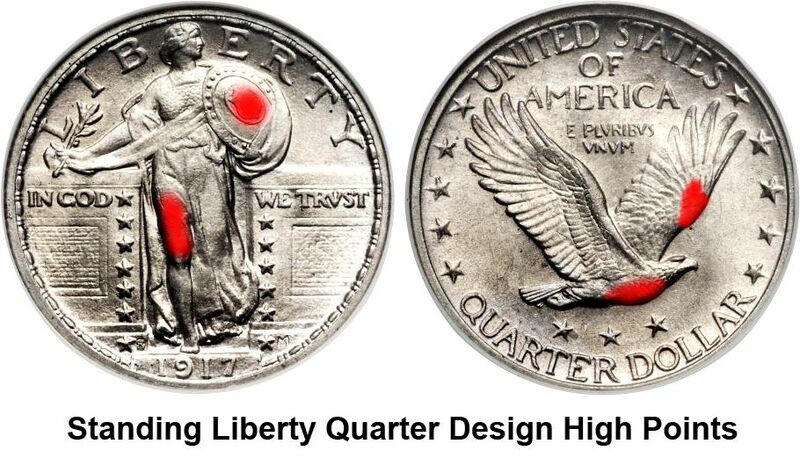 If you believe your Standing Liberty quarter is uncirculated, look at these areas on the coin first to see if you can spot any wear. If there is evidence of wear, then it is not uncirculated and must be graded as a circulated coin. Summary: A Good-4 coin is heavily worn over the entire surface of the coin. The devices, lettering, legends, and date are readable but may have some faintness in a few areas. All major features are visible in at least outline form, and the rim is mostly complete but may be incomplete in a few areas. Obverse: On Type 1 coins a majority of the date is worn away and is barely decipherable. On Type 2 and Type 3 coins, the date is readable, but the top may be worn flat. The rim is complete but may be worn flat in a few places. Reverse: The eagle is worn almost smooth and is mostly just an outline. The rim is complete but worn flat. However, the rim may be extremely weak in a few areas if the coin was not struck with adequate pressure. Summary: A Very Good-8 coin is well-worn. The design is clear and major elements are defined but are flat and lacking in detail. Obverse: The entire design on the obverse is weak but the major details are apparent. This includes most of the main details on Lady Liberty's gown but is flat. On Type 1 coins the date is heavily worn but distinguishable. On Type 2 & 3, all letters are clear and the numerals in the date only show evidence of wear on the very highest points. Reverse: The large feathers at the end of the eagle's wings are well separated and the eagle's eye is distinguishable. The rim is complete and full. Summary: A Fine-12 coin shows moderate even wear over the entire surface of the coin. The major design elements are bold and all lettering, legends, and date are clear and readable. Obverse: For Type 1 coins, details on the gown are worn nearly smooth across Lady Liberty's body but major details show at the sides. The top of the right leg is nearly flat and so is the toe. The date may be nearly complete. On Type 2 & 3, the details of the gown show clearly across the body although worn, some detail on the chain mail coat are visible. The outer edge of the shield is complete on both types of coins. Reverse: The eagle's breast is worn almost smooth and half of the wing feathers are visible. Summary: Very Fine-20 coins show moderate to minor wear exists only on the highest parts of the design where a slight flatness is beginning to show. The overall condition of the coin is pleasing and attractive. Obverse: Lady Liberty's breasts shows heavy wear but are distinct. Wear is also evidence on the shield and the leg. The gown line across her thigh is partially visible. The inner circle on the shield is complete. Reverse: The eagle's feather ends and folds are visible on the right wing. Some of the finer details in the feathers are starting to appear. Summary: Extra Fine-40 coins only have the slightest wear on the very highest points of the coin. All details are sharp, and all design elements are well defined. Some traces of mint luster may still exist. Obverse: Wear is evident on Lady Liberty's breasts and right leg. The gown line crossing her thigh is starting to become visible. Her right leg is flat on the top but is beginning to show evidence of being rounded. Reverse: The high points on the eagle's wings are slightly worn, and more delicate details in the recessed portions of the design are clearly visible. Traces of mint luster may remain. All of the lettering near the rim is crisp and clear. Summary: An About Uncirculated-55 coin has minor traces of wear or minor abrasions, and they are visible on only the highest points of the coin. Mint luster is almost complete, and the surfaces of the coin are well preserved. There may be many significant contact or bag marks across the surface of the coin. Obverse: Only a trace of wear is evident on the highest points of the design. This includes Lady Liberty's head, breast, the inner part of the shield and her right leg above the knee. Reverse: On Type 1 coins only a trace of wear will show on the edges of the wings, breast and tail feathers. On Type 2 & 3, only a trace of wear will be evident on the eagle's breast and edges of the wings. Summary: No traces of wear from circulation exist on a Mint State-63 coin. Mint luster is complete but shows minor impairments. Many contact marks, bag marks, and hairline scratches are visible without magnification on the coin's field and major design elements. Overall, the coin has an attractive eye appeal. Obverse & Reverse: There are no obvious signs of wear from circulation on the highest parts of the design. There may be a few distracting marks in the prime focal areas (Lady Liberty's body and the date) and several scattered bag marks and hairline scratches. Summary: A Mint State-65 coin has a high-quality mint luster that completely covers the surfaces of the coin and is undisturbed. Contact marks and bag marks are few and small. The coin is well struck and a few hairlines may be seen under a magnifying glass. Overall the coin is brilliant and has an above average eye appeal. Toning may be acceptable at this grade if it is pleasing and not distractive. Obverse & Reverse: There are no traces of wear anywhere on the coin. There may be light and scattered contact marks, but no distracting marks in the prime focal areas. Luster must be complete and overall pleasing. Obverse & Reverse: No traces of wear are evident anywhere on the coin. There are no distracting marks and the mint luster is above average. All details of the coin are sharp, even on the highest points of the coin and the eye appeal is superb. 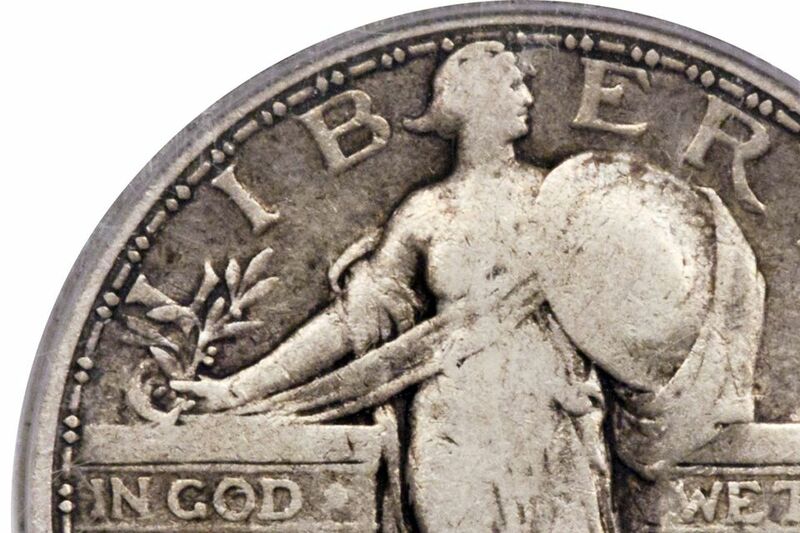 If all the details on Lady Liberty's head are clearly visible on an uncirculated (i.e., Mint State) coin, then the Full Head ("FH") designation may be added as a suffix to the grade. The coin graders at NGC offers this definition, "All details in hair are well defined; hair line along face is raised and complete; eyebrow is visible; cheek is rounded." Notice that Lady Liberty's head in the photo ("Not Full Head" example) is flat. This is not because it was worn away, but because the coin was not fully struck in the metal did not flow into the deepest recesses of the die. Since there are three different subtypes of Standing Liberty quarters, I would recommend purchasing one of the following references to take your coin grading skills to the next level. Clicking on the links below will find the lowest prices on the Internet for you. Having been a coin collector for a majority of my life, I have witnessed firsthand the evolution of coin grading standards over the last forty-five years. I have studied coin grading under the guidance of professional coin graders from NGC and PCGS. I have read many books and worked with many coin dealers to sharpen my skill in grading coins. Coin grading is an opinion that one person believes reflects and describes the condition of a given coin. The information presented in this article is my opinion on how to interpret the many coin grading standards that you will encounter. This is not a universal, absolute and definitive definition of how this particular coinage series should be graded.